Members of Microsoft’s Xbox One preview program are getting access to a bevy of new features this week, including deeper Twitter integration and more customization options. 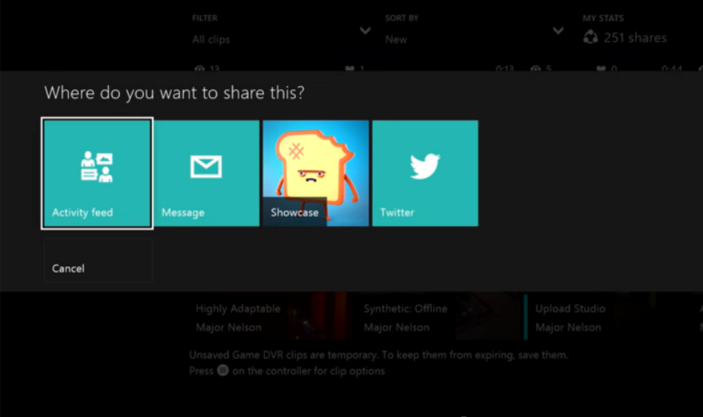 As Microsoft notes, you will now be able to link your Xbox Live acccount with Twitter, and tweet your favorite game clips to your followers using the Share button next to any clip you’ve created. Plus, new live TV and Twitter integration unlocks the ability to see what shows are trending based on Twitter chatter, and you’ll also be able to view tweets for programs in real-time within the MiniGuide. You will also be able to tailor the background for each account on the console – this could be color or achievement art – and is what Microsoft refers to as the most fan-requested feature. Other incoming updates, which will open to all Xbox One gamers in November, include revealing your location and basic bio within your profile, and selecting your preferred showcase items when others look at your profile. And you will also see a new Live TV Trending tab in OneGuide, which displays the top 20 most watched shows.